All is well in the world of Whitworth football. In their first three games of the season, the Pirates (3-0) skated through nonconference play this month, outscoring their opponents 158-23. Now Whitworth prepares for its first real test of the season – the Linfield Wildcats. The Pirates head to McMinnville, Oregon, to take on the Northwest Conference powerhouse on Saturday in the NWC opener for both teams. It’s the conference showdown fans seem to look forward to – or dread – every season, simply because of Whitworth’s not-so impressive record against the Wildcats, ranked No. 9 in the D3football.com national poll this week. If you’re looking at the history books, the Pirates no doubt have their work cut out for them this weekend. To put it simply, “They’re used to winning,” Whitworth head coach Rod Sandberg said of the Wildcats. They’re certainly used to beating the Pirates, who have not taken down the conference bully since 2007 when Whitworth won 10-6 in Spokane. The last time Whitworth took down Linfield on its home field was in 2006 when the Pirates walked away with a 17-13 win. Since their first meeting in 1952, the Pirates have defeated the Wildcats only five times in 43 games. Perhaps what’s more impressive is Linfield’s long-standing winning streak that stretches back decades. The Wildcats haven’t had a losing record since 1955. Their now 61-season winning streak is amongst the longest of any American football team at any level, and has no doubt made for a tough matchup in the NWC. Linfield’s daunting record hasn’t held down Whitworth’s confidence heading into Saturday’s showing, Sandberg said. 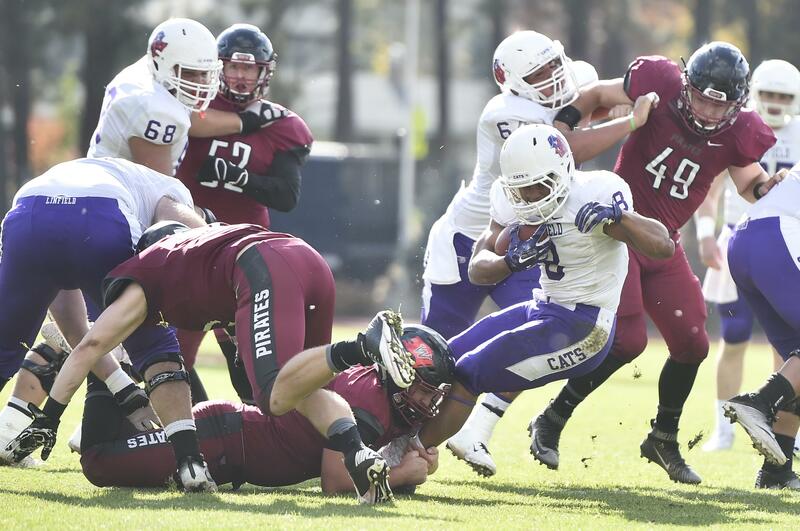 Linfield’s historically tough defense lost a handful in the secondary to graduation, a glimmer of hope to a Whitworth team that relies heavily on its passing game. The Pirates, who began rebuilding four years ago when Sandberg entered the program, have welcomed back the majority of their starters from last year’s roster. Leading the Pirates’ offense once again is fifth-year senior and All-American quarterback Ian Kolste, who has faced the Linfield defensive line four times in three years. The majority of his O-line is back from last year, including fifth-year senior running backs Griffin Hare and Casey Bond. Senior wide receiver Nick Kiourkas is also back looking to continue his impressive 34-game streak of at least one catch. The Pirates appear to have one of their strongest defensive lines in recent years to compliment their veteran offense this season. Whitworth’s starting defense has yet to surrender a touchdown. Sandberg’s second and third stringers have allowed opponents only three touchdowns since the season began Sept. 2. The Wildcats, on the other hand, are coming off a tough 24-3 loss to No. 1 Mary Hardin-Baylor on Sept. 16 ahead of a bye week. The loss evened Linfield’s record at 1-1. Sandberg said the Pirates have all the pieces to finally pull down Linfield, a feat his seniors have been craving since they stepped foot into the Whitworth program several years ago. Published: Sept. 29, 2017, 8:31 p.m.